I am truly lucky to have so many wonderful friends. I feel so fortunate to know a wide variety of different types of people with such varied backgrounds and stories. Everyone is unique, and each has their own story. Most of my friends touch me in ways that they don’t even know. One of these friends is a wonderful lady named Laura Wales Holliday. 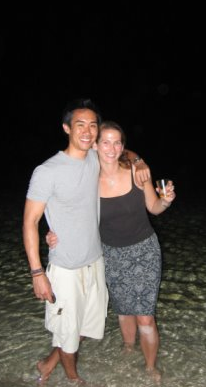 Laura and Ken became friends at Stanford Business School. Although I knew Laura from social gatherings and events, it wasn’t until we both ended up in New York post grad school that we became friends. That said, she had already deeply influenced my life. Her story — courage and survival — made such an impact on my life that I had often shared it with other friends or strangers, passing along her strength, life, and passion, and reminding people to be thankful of the life that they have been given. Sadly, Laura was involved in the Tsunami in Thailand in 2004. I remember learning about the tsunami with Ken when we were on a ski vacation with my family on Christmas vacation that year. We heard about it on the news, and instantly, Ken became nervous, as he knew that he had many classmates in Thailand on a study trip. 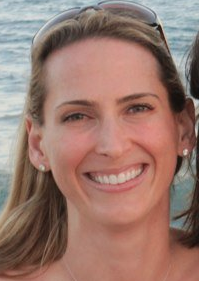 It wasn’t until a couple of days later that we learned the impact of the tsunami on Ken’s classmates, including Laura. Here is Laura’s story, which provides such inspiration and a message to live life to the fullest and be fully thankful for everything that we have. For the past 9 years, I have read this aloud to my students as I know EVERYONE can take something away from Laura and her strength. On December 23rd, I boarded a ferry with five classmates to Koh Phi Phi, a tiny island off of Phuket. We were all looking forward to relaxing after a whirlwind 11-day study trip through Singapore and Thailand. The island resorts were at full capacity for the holiday week, so we had to split up our small group. Bonnie and James checked into the three-story Banyan Hotel on the south side of the island while Lorri, Stephan, and I checked into a bungalow at the Phi Phi Charlie Resort on the north side of the island. For the next three days we enjoyed ourselves hedonistically—eating, swimming, bar hopping, and getting Thai massages. On Christmas Eve there were fireworks on the beach, and I sat with James on lounge chairs and together we made Christmas resolutions. It didn’t feel like the holidays, but it was the best Christmas Eve I’ve ever had. A picture of all the friends gathered together for Christmas. On December 26, I woke at 8:15 a.m. to pounding on the door. My roommate Stephan had signed up for a diving certification program and was supposed to have met the group at 8 a.m. The dive instructor was looking for him. Stephan jumped out of bed and looked wildly around the room: his clothes and toiletries were strewn all over the bungalow. We were supposed to check out by 11 a.m., and Stephan’s dive would last until after 3 p.m. “Don’t worry, I’ll pack for you,” I mumbled before falling back to sleep. Around 9:30 I woke up again, showered, and started packing. About an hour later James knocked on the door. I let him in, inquiring why Bonnie wasn’t with him. He explained that Bonnie didn’t want to get sandy before our ferry ride back to Phuket and had opted to hang out by the pool at their hotel until we left. We continued chatting as he helped me finish packing up Stephan’s belongings. Suddenly a ferocious wind hit the bungalow, rattling the window and shaking the palm trees outside. At the same moment, the overhead light went out. I looked out the window in time to see a dark wall of water exploding around the sides of the bungalow in front of ours. It appeared to be just above chest-level, and was moving with a velocity and roar that I’d never seen or heard before. I knew instantly what it meant. “Oh my God, it’s a tsunami!” I yelled to James as I grabbed his arm and jumped on the bed, pulling him up after me. Unfortunately, the water wasn’t just chest deep. What I saw must have been the very beginning of the 20-foot wave behind it. When the wave hit our bungalow I was ripped apart from James and never saw him again. I’ve never felt anything like the force of that wave. The blow was like a solid object striking each area of my body simultaneously. I was thrown backwards as the bungalow’s roof and walls crashed on top of us. For a minute I simply tumbled with the water as the entire bungalow was swept inland, and then suddenly the movement stopped. Everything was dark and I was pinned down by debris and the weight of the water, unable to move any of my limbs. In retrospect, this must have been when my legs were gouged by pieces of the building, but at the time I was only aware of a general crushing sensation throughout my body. My first thought when the wave hit was that it must be another one of my dreams. It was incomprehensible that I was actually living out my fear of being hit by a tsunami. But I quickly realized that it was real, and that my chances for survival were slim. I had been under water a few minutes, I couldn’t see my surroundings, and I couldn’t move anything except my head. The weight of the water over me didn’t seem to be lessening, so my hope that the water would recede seemed in vain. The crushing sensation intensified in my chest as my need to breathe grew stronger, and I knew if I didn’t get air I wouldn’t make it much longer. If I had to die, I didn’t want my last seconds to be spent scared and struggling. I relaxed my body and thought about my family. I knew how much my death would devastate them and wondered how they would cope. In my mind, I repeated over and over to my parents, “I’m so sorry, I love you, I’m so sorry.” Then finally I couldn’t stand the pain any longer. There was nothing I could do but the urge to breathe was so intense that I opened my mouth and started inhaling the water. I can still remember the gritty taste of the water, full of sand and concrete. I wanted nothing more than for the pain to stop, and after a few moments it did. As my lungs filled, my vision went from blurry darkness to pure white. The weight of the water seemed to disappear and I felt light again. I was a moment away from either unconsciousness or death. Before either occurred, another wave hit and something that was trapping me suddenly shifted. I gave one instinctive kick and suddenly my head was above water and I gulped a breath of air. The strong current of the second wave grabbed me and pulled me across the small island. I struggled to stay above the river of water, and that struggle consumed most of my energy so that I wasn’t aware of where I was or of what else was happening around me. At one point I saw a building ahead. The majority of the bottom floor had been washed away and water was racing through the newly created tunnel. The northern walls had also been knocked off, and I could see straight into the hotel rooms. I saw a Thai man standing in the room right in front of me. I threw up my arm and he caught my hand just before the water pulled me under the building. I looked up at him and cried, “Please hang on, please don’t let go,” but even as I pleaded I could feel my hand slipping away. The current pushing my body was too strong and he had to let go of me in order to avoid being pulled into the water. I hope that man knows that I am alive, so that he isn’t plagued by memories of my frantic eyes. I was swept under the hotel before the wave died and the remaining water washed me onto a pile of debris on the south beach. I immediately vomited and coughed up some water and sand. My contacts were gone and my ears were packed with sand, dulling my senses. My shoes and jewelry were ripped off, but miraculously my bikini and sarong had stayed perfectly in place. I looked around for somewhere safer to rest. Nearby, a few feet of wreckage had piled around a palm tree. A Thai man stood on that pile, hugging the palm tree. I started making my way there, half walking, half crawling over the pieces of boats, roofs, bicycles, etc. The man pointed at my legs and shouted something in Thai. I looked down and saw that a section of my right leg was hanging off, held on by a small area of skin. “I know, I know, I’m hurt,” I replied to him, not caring that he couldn’t understand me. When I finally made it up to the palm tree, the man immediately left. Maybe he wasn’t injured and so was able to seek even higher ground. Or perhaps he didn’t want to share his space with a Western girl who might bleed to death next to him. Either way, I was alone. I took a thorough look at myself and noted where I was hurt. By this time my body had gone into blissful shock, so the pain and bleeding were subdued. The worst of the injuries was on my right leg where about a fourth of my shin was gouged out. I could see at least six inches of exposed bone. My ankle was also gouged and was swelling up like a melon. I assumed it was broken. I took the muscle and skin that was hanging off my shin and pressed it onto the exposed bone. I tied it in place with my sarong, although the water and blood made my sarong slip off the first few times I tried. From somewhere I couldn’t see, I heard an Australian woman shout, “Hang on, there’s another wave coming!” I struggled onto my injured legs and bear-hugged the palm tree. Luckily this was the third wave, and I was now on the sheltered side of the island. So the force of the debris cut and bruised my back, but the water only reached my neck. When it receded, I lay down on the shifting rubble and realized that even if another wave came, I wouldn’t have the strength to stand up again. I was exhausted, and all I wanted to do was close my eyes and sleep. But I’d read enough to know that falling asleep while in shock could be a death sentence, so I struggled to stay awake. I remember looking at what I was lying on—some pieces of wood with rusty nails sticking out—and being grateful that I’d gotten all of the recommended vaccinations for travel. They were so expensive that I had nearly rolled the dice and gone without them. Every few minutes I yelled, “Help!” and in the distance I could hear others doing the same. My cries were feeble because my lungs were still so full of water and sand that my breathing was quick and shallow. In retrospect I’m glad that my contacts were washed away, because I couldn’t quite make out the death and destruction around me. Hollywood movies train us to believe that when there is a crisis, the U.S. Air Force is just minutes behind. So even though I knew it wasn’t realistic, I kept waiting for the sound of helicopters overhead. Of course, at this point I figured the tsunami had only hit Koh Phi Phi, or perhaps a few neighboring islands. The extent of the tragedy and the need for resources elsewhere never occurred to me. After some time, a few uninjured Westerners came down to the beach and I called out to them. They created a sling from a piece of ripped material on the beach and half dragged, half carried me up into the second floor of a nearby hotel on a small hill. They lay me on one of the beds next to a woman who was bleeding extensively and who never said a word for the four hours I lay next to her. A group of generous ex-patriots and vacationers from various English-speaking countries took turns taking care of us and going down to the beaches to look for other survivors. One man tore up sheets from another hotel room and re-bandaged my leg. I allowed myself to be comforted by their cheerful assurances that everything would be all right, despite the fact that I could hear their panicked conversations once they left the room. One kind girl found a half-empty bottle of Advil and offered me two. I laughed at the small dosage since I normally take four just for a headache, but accepted. The pain was seeping through the shock and becoming unbearable. Finally we heard the sound of a helicopter and a few of the men went to find out where it was landing. The evacuation zone was on the opposite side of the island, so they had to carry the injured through streets piled high with debris. The men managed to knock a few doors off of the hotel rooms and used the doors as stretchers to transport the injured. When my turn came, they found an intact bench and laid me on it. The trip across the island took over an hour, although it could normally be walked in ten minutes. The men kept stopping to lift me over obstacles or to put me down so that they could rest their arms. The evacuation zone was nothing more than a relatively clear area next to a basketball court where the helicopter could land safely. All during my bumpy and painful ride across the island I had fantasies that the medics on site would be carrying shots of morphine and administering them with a heavy hand. I was disappointed to find that the medics had brought nothing with them except some gauze, iodine, and Tylenol. The area was full of bodies lying on makeshift beds or sheets and from every direction I could hear people groaning. Many of the injured had friends or family with them who were advocating for their care, insisting that their loved one be put on the next helicopter or receive more Tylenol. I was worried that the medics would overlook me since I was alone and was only referred to as “Leg Wound”—which was not an impressive title in the midst of “Skull Injury” and “Broken Back” patients. My leg was still wrapped in ripped sheets, but the medics were worrying less about cleaning wounds than prioritizing who would take the limited spaces on the helicopter to Phuket. When the sun went down the medics mandated that all the injured be covered from head to toe to keep the mosquitoes away. Already, flies were covering my bloody legs quicker than I could swat them away. Hotel sheets and towels were used to cover the wounded, and the effect of so many bodies shrouded in white made the area look like a morgue. Sometime after dark Stephan showed up by my side, and I’ve never been so happy to see a friend. The terrifying feeling of being alone vanished when he lifted back the sheet that covered my head and smiled down at me. He took turns caring for me and helping to get other injured patients to the evacuation zone. While he was with me, we were able to smile and crack jokes together. But behind each of our smiles was fear for James and Bonnie. I was especially afraid for James. My escape was so narrow, and when James didn’t appear at the evacuation zone I was certain he didn’t make it. I felt guilty for lacking faith, especially when others reassured me that he was surely okay and that a lot of people were still being rescued. I tried to keep my spirits buoyed by hope and prayer, but the hope felt fake and hollow. After each helicopter left, rumors circulated throughout the evacuation zone that it had been the last helicopter for the night and that anyone remaining would be left until morning. There were also steady rumors of another large aftershock in Indonesia and a subsequent wave coming our way. Everyone was jumpy and became frantic whenever the wind would pick up for a moment. Fear underlay every movement of the night. When it appeared that I would not make it off the island that night, Stephan carried me to the second floor of an intact hotel near the evacuation site where I would be safe from a second tsunami. The hotel was only 50 feet away, but the journey took over 20 minutes due to large holes that peppered the ground and led straight into the sewers. At last a medic looked at my leg again and realized it was worse than he’d previously thought. And Stephan, being a champion marketer, pointed out my ragged breathing. When the medic listened to my chest, he decided to put me on the next helicopter. His decision gave me the first moment of relief that I’d had in 12 hours. Stephan and a few of the other men loaded me onto one of the hotel doors and carried me to the helicopter. I hated to leave without Stephan, but he promised to find me in the hospital the next day in Phuket (Little did he know, the helicopter took us to Krabi instead, so Stephan wound up wasting the next day searching the hospitals in Phuket without luck). I arrived in Krabi and doctors operated on my legs immediately, while I was still in the lobby of the hospital. The lobby was full of other gurneys and every square inch seemed to be packed. A nurse cut off my bikini and threw a hospital gown loosely over me while a doctor started to unwrap my bandaged legs. Amazingly, none of my bones were broken. Next to me, a man shrieked as a doctor poured disinfectant (I assume) into a hole in his arm. Luckily, the nurse must have given me painkillers because the next thing I remember it was morning, and I was laying on a hospital bed with both of my legs bandaged from knee to toe. My hair was still matted with sand and when I coughed, bits of sand came up with the phlegm. My time in Krabi seem like a bad dream. I was wildly uncomfortable, both physically and emotionally. I didn’t know if Bonnie and James were okay, I hadn’t talked to my family, my legs throbbed, and other than the water poured into my mouth, I was given no food or drink. I realized later how lucky I was to have a bed, but I didn’t know at that point about all the patients who were on the floor. I was lonely despite many kind strangers around me and had no idea how or when I would get out of the hospital. Fortunately, the people around me were amazingly kind and generous. One woman brought in her cell phone so that I could call my family. When I was finished talking to them she took the phone and told them—out of my earshot—to get me out of the Krabi hospital, whatever the cost. She could see, better than I could, the inadequacy of the care I was receiving. Although I was no longer in shock, I was definitely still out of touch with reality. When I talked to my parents, I told them not to come to Thailand because I honestly believed I would be sent home in a day or two. Back in the U.S., my friends and family were panicked and trying to figure out a plan of action. 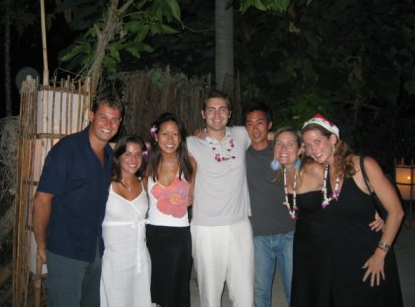 Classmates worked diligently to locate James and get me out of Krabi, making phone calls and searching the Internet. Finally my mother got in touch with my classmate Bryan, who was still in Bangkok. When he heard what had happened, he got on the next possible flight to Krabi. At the hospital, he walked up and down the rows of beds, searching for me. But I was so bloated from drowning and so matted with blood and sand that he walked by me twice before a nurse helped him identify me. Bryan stayed with me for the rest of the day and that night, leaving only to search other hospitals and the morgues for James. He brought the news that Bonnie was safe and had escaped to the hills. During the day, he spent a lot of time on the phone, arranging for me to be transported to Bumrungrad Hospital in Bangkok. We had visited Bumrungrad as part of our study trip, and it is regarded as one of the top private hospitals in Southeast Asia. Bryan and I, along with ten other patients and various doctors, flew to Bangkok at dawn the next morning. I was admitted to the ICU at Bumrungrad and diagnosed with pneumonia and septicemia (blood poisoning). Septicemia is a quick killer if left untreated, and my doctors emphasized to me that I would have died if I’d remained at Krabi. My parents realized that I wouldn’t be coming home any time soon, so my mother made plans to come stay with me in Bangkok. My days in ICU took on a sort of bizarre routine. Every morning I went to the operating room where I was put under so the surgeons could treat my legs. I didn’t know then that they were cutting out infection to avoid amputation. Every afternoon a lung physical therapist would come and hit my back rhythmically, helping me to cough up the sand that still plagued my breathing. My mother arrived two days after I got to Bangkok, and stayed with me for two weeks. I’ve always found it comforting to be with family when I’m sick, and it was heavenly having her there when I was not only sick, but in a foreign country and distraught as well. It was during this time that James went from “missing” to “presumed dead”. At night, when I woke up crying, I wasn’t sure if it was physical pain or longing for James that started the tears. After 16 days I was deemed fit to fly, and I returned to California on January 11th. I flew with a doctor, and was met by an ambulance that brought me straight to Stanford Hospital, where I have been ever since. I’m not sure how much longer I will be in the hospital. 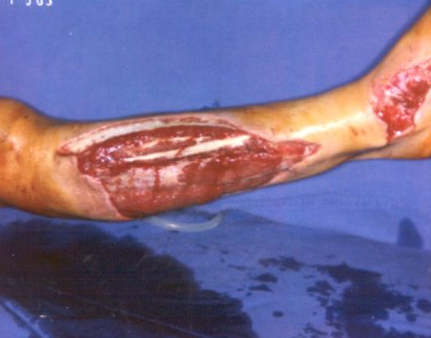 As soon as the wound has enough muscle tissue growing in it, I will receive a skin graft. In a month I should be walking on crutches, and in two months it will be as though I was never in the tsunami. Except, of course, for the scars…on my legs, arms, and back, not to mention in my heart. 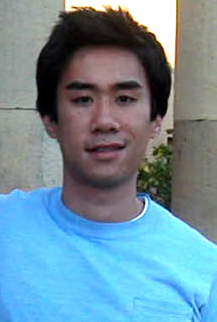 James Hsu‘s body was found four months after the tsunami. Classmates from Stanford raised about $100,000 for the Red Cross in his memory. Laura, beautiful as always with a smile on her face, just months after the tsunami. She has made a full recovery. For the strong of stomach, a picture of the initial wounds that the tsunami caused to Laura’s leg is here. Her full recovery is nothing short of amazing. Laura is one of the kindest, strongest, funniest, and most sincere people I know. I am thankful to have her as a friend and am grateful she is alive and well. Laura lives in New York City with her husband, Tim, and is expecting their first child, a boy in August. She works for J Crew and is successful at everything she puts her mind towards. The 2004 Tsunami in the Great Indian Ocean is often considered one of the deadliest tsunamis in history. There’s no official death toll because so many people were burned/buried before final counts were made; however the generally agreed upon number is 230,000 people. Laura’s story rocks my core every single time I read it. Her words are so powerful, honest, and real. She makes me realize how lucky we all are to be alive, have two arms, two legs, and a beating heart. Laura’s strength, determination, and courage continue to be an inspiration. Especially when my troubles are only lack of sleep and a jealous toddler. At least they are alive and well. I hope this story inspires you just as much as it does me. Such an inspirational story. Thank you for sharing. Thanks to Laura for being such an inspiration. i will never forget that time and the tragic loss of james. but the story of laura’s bravery and strength and how she saved her own life is so unbelievable and inspiring. life is precious and truly something to be grateful for. Thank you for sharing this story. Nature has a way to cause many tragedies, and in this case, Laura,helped by others, lived through a huge tragedy– a real miracle. She is alive and well, and now will have a child to carry on her legacy. Best wishes for continued good fortune. We all today have the greatest gift of all, the gift of life. Thanks for your comment, Mama. We truly are all lucky to be alive and healthy. Glad to hear that you survived this horrific experience. I am an industrial design student at the California College of the Arts. And I am currently working on a project on emergency lights during a tsunami. Therefore I was wondering if I could do a quick interview/questionnaire via telephone or e-mail. It will help me a lot to get some more insight on your first hand experience with this natural disaster. I think this story is truly inspirational. We are doing a survival speech in English and I am going to speak about Laura. Truly, thankyou. to keep hydrated also to make you obvious or audible to the rescuers. your child receiving freezing or drenched. I’m working on a science doc about the South East Asia tsunami 10 years on and I’m looking for survivors to tell their story on camera. If Laura would be interested in sharing her tale, please let me know. Best wishes, LW. I am an industrial design student at the California College of the Arts. And I am currently working on a project on emergency lights during a tsunami. Therefore I was wondering if you have any contact info of the people you interviewed so I could do a quick interview/questionnaire via telephone or e-mail. It will help me a lot to get some more insight on their first hand experience with this natural disaster. i have just read this in my hotel room on phi phi.sorry for your loss and you are a very brave person. An amazing account of what happened to Laura on Boxing Day 2004. I was also on Phi Phi on that terrible day but incredibly lucky to have walked away unhurt. I can’t believe it was 10 years ago but I’ll never forgot those who didn’t make it. Thank you very much for the inspiring story of Laura Wales. I am an industrial design student at the California College of the Arts. And I am currently working on a project on emergency lights during a tsunami. Therefore I was wondering if you have any contact info of Laura Wales so I can do an interview/questionnaire with her. It will help me a lot with getting some more insight on her story. I am in Thailand right now, sitting at PP Princess, next to the Charlie Hotel, unimaginable to believe I could be sitting in the same spot where you watched the first wave hit your room. God bless you and all who survived and lost during the 2004 tsunami. Totally makes me look at the island in a completely different way. I always found worth content here,Would like to visit again.Keep posting interesting articles like this..